Experts in ornithology are always changing the common and scientific names of many of our favorite birds. That’s why since I began birding I have had to adjust myself to accept the Eastern Towhee for the bird I first learned as a Rufous-sided Towhee – still a much more accurate and interesting name – and Blue-headed Vireo in place of Solitary Vireo. Blue-headed is more descriptive of the appearance of this bird, but as someone who can be a bit of a loner, I also appreciated the “solitary” moniker. Name changes, however, rarely inspire the controversy that one did more than a decade ago when a duck formerly known as “Oldsquaw” had its name changed to “Long-tailed Duck.” In 2000, the American Ornithologists’ Union Committee on Classification and Nomenclature was petitioned to make the name change. Biologists with the U.S. Fish and Wildlife Service in Alaska requested that the English name, or common name, of Clangula hyemalis be changed from Oldsquaw to Long-tailed Duck, the name that had long been used for the species outside of North America. The biologists noted that the species was declining in numbers in Alaska and that their conservation management plans required the help and cooperation of Native Americans. The biologists expressed concerns that the name Oldsquaw would offend the Native Americans they were trying to recruit to assist them with efforts to protect this particular duck. 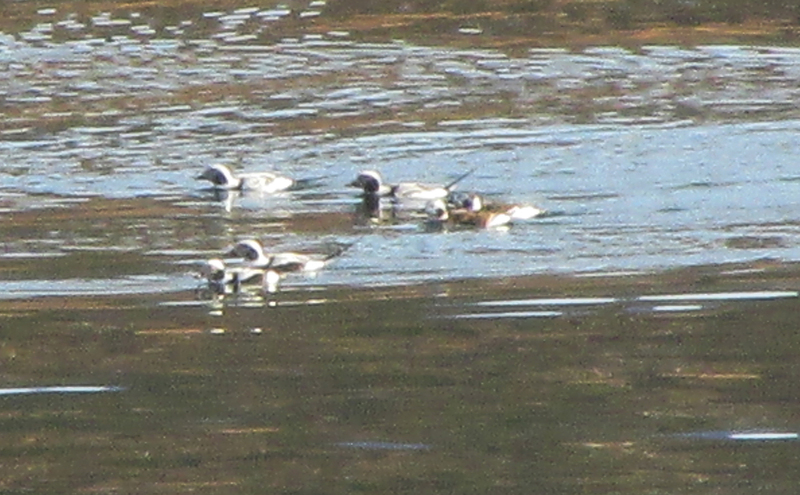 Six Long-tailed Ducks photographed last month on Holston Lake. It wasn’t the first request to change the name, but it was the one that convinced the members of the committee to approve the petition. The members did state a reluctance to consider political correctness alone as a reason for changing long-standing English names of birds. In essence, the committee was willing in this particular instance to adopt an alternative name already in use in much of the world. How did this duck ever get saddled with the name “oldsquaw” in the first place? The name was apparently inspired by the rolling three-noted call made by (here’s irony for you) the male ducks. In flocks, drake Long-tailed Ducks are very sociable and excitable. They like to “talk” with each other. Somewhere, back in the early days of ornithology in North America, someone apparently felt these vocal ducks reminded them of “old squaws” engaged in gossip. When I think about it, I can see why the name did have some heavy baggage regarding racism and sexism. Long-tailed Ducks range the far northern regions of North America, Europe and Asia. In North America, these ducks breed in the high Arctic regions of Alaska and Canada. They winter in the Great Lakes and along both coasts as far south as northern California and the Carolinas. It was the fact that the severe cold this winter has frozen solid the Great Lakes that pushed Long-tailed Ducks south in almost unprecedented numbers. I am thankful for this unanticipated consequence of the severe cold snaps in January and February. After all, it allowed me to finally get an excellent look at Long-tailed Ducks 14 years after I first added this species to my life list. I have a few birds checked on my life list that I have technically observed in the field without enjoying particularly satisfying observations of the birds. Often, such unsatisfactory observations stem from either a fleeting glimpse of a bird or a look at one from a great distance. For instance, I observed Buff-breasted Sandpipers only one time several years ago during a visit to Rankin Bottoms at Douglas Lake. My look at the distant sandpipers through a spotting scope gave me only a blurry image of the birds on mud flats shimmering with waves of August heat. That observation didn’t exactly burn itself with great clarity into my memories. That happens, although thankfully not too often. I usually just patiently await a second sighting of these listed birds and hope that the next encounter will offer a more memorable experience. That’s what happened a couple of weeks ago when I took my mother, Peggy, to Holston Lake. We visited a boat launch on Highway 421 to scan for some visiting Long-tailed Ducks. My first sighting of Long-tailed Ducks dates back to 2000, when I compiled an admirable list of 220 species of birds in a single year in Northeast Tennessee. 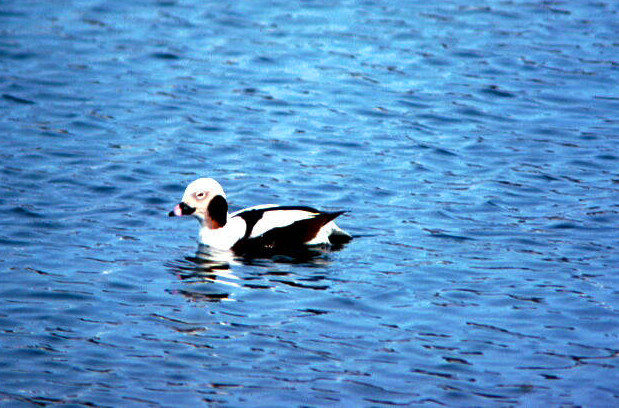 I saw several Long-tailed Ducks from the overlook at Boone Dam while birding with the late Howard Langridge. Even peering at the birds through Howard’s powerful Questar spotting scope, it was difficult for me to detect anything significant about the birds. They were little white and black dots bobbing up and down on the choppy waters of the lake. A cold, howling wind and snow flurries also made conditions less than perfect for observing anything at a distance. If my memory can be trusted, those Long-tailed Ducks were one of the last birds we found in 2000. I think we saw them in late November of that year. 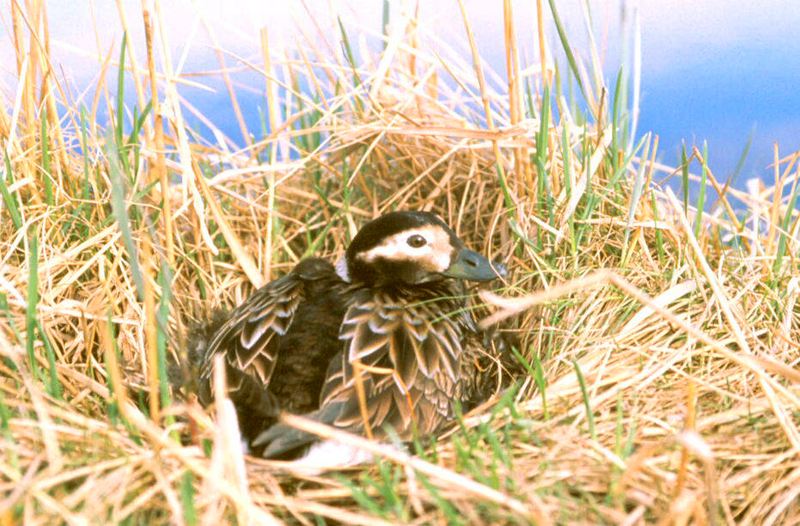 A female Long-tailed Duck is shown on her nest on the Alaskan tundra. Since that time, I have followed up on the occasional report of a Long-tailed Duck. These rare visitors pop up at some dependable locations, such as Middlebrook Lake in Bristol and Musick’s Campground on South Holston Lake. By the time I have received posts about such sightings, the duck has inevitably flown the coop by the time of my arrival. The six Long-tailed Ducks at Holston Lake, however, didn’t conform to the usual pattern of a quick visit by a single duck. In fact, they lingered for several days before I even motivated myself to make the long drive from Hampton to Holston Lake to look for them. When my mom and I arrived at the boat launch, we were astounded by the sheer number of Ring-billed Gulls present. There were hundreds of these medium-sized gulls flying over the lake and floating on the water. In addition, we also quickly detected several dozen Buffleheads as we scanned for Long-tailed Ducks. After about 20 minutes of finding only gulls and Buffleheads, I began to feel my luck hadn’t changed at all when it came to Long-tailed Ducks. I began taking photos of some of the cooperative Ring-billed Gulls. Once I had some snapshots of the rollicking gulls, I scanned the lake one more time with my binoculars. While looking in an area I had already scanned, I spotted six ducks that didn’t look at all like Buffleheads. When I got a good look, I realized I had found my target birds. I rushed back to my car and removed my spotting scope from the trunk. It took a few minutes to get the tripod steady. As soon as I focused the scope, I found myself enjoying a fantastic look at two adult male Long-tailed Ducks and four females or perhaps immature specimens. These six Long-tailed Ducks were part of a massive and unusual movement of this species into Tennessee lakes and reservoirs this winter. Throughout February, it seemed that these ducks were popping up everywhere throughout the Volunteer State. Count yourself fortunate any time you spot a Long-tailed Duck. Of all the diving ducks in North America, it spends more of its time diving beneath the surface of the water than any of its relatives. Experts have determined that this duck spends at least two-thirds of its time diving for food. So, perhaps all those fruitless searches can be explained quite simply. I arrived when the ducks were hungry and not present above the surface! 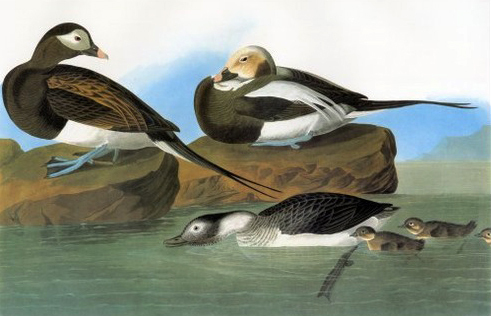 Early North American naturalist John James Audubon painted the Long-tailed Duck in various life stages, including ducklings. I read one account about this duck that suggests the term “Long-tailed Duck” is sexist on the account that only the males possess the namesake long tail feathers that provide the inspiration for the common name. I don’t completely buy that argument. Many birds with descriptive names only describe the male bird. Think of the Black-throated Blue Warbler or the Scarlet Tanager, to name a couple. Anyone seeing female Black-throated Blue Warblers or Scarlet Tanagers would have a difficult time trying to match the bird’s name with what they are seeing. A drab brownish warbler and a greenish tanager don’t look at all like their male counterparts. I spoke by phone this past week with Linda Powell, who lives on nearby Tiger Creek Road between Hampton and Roan Mountain. Linda called me to inform me that her neighbor found an unusual bird after it flew into a fence and was killed. She believed the bird might have been a duck, but she had never seen anything like it. As she described the bird to me, including its black coloration and large, green feet, I began to suspect that the unfortunate bird was probably an American Coot. She also noted that the bird’s bill was light in coloration, which was another indication of a coot. The habitat also seemed favorable for a migrating coot. Although there isn’t a pond in the pasture where the bird was found, there is a wet, marshy area that would probably have been sufficient to attract this bird. The coot was killed after it ran into a section of barbed wire fence. Unfortunately, it probably didn’t see the barbed wire until it was too late. I made some first spring sightings of a couple of birds this past week. Three European Starlings made an appearance with a flock of American Robins on March 4. A few starlings are usually present from spring to early fall. At least they are never common and don’t extend their visit into the winter season. On March 3, when a light snow covered the ground at my home on Simerly Creek Road in Hampton, a female Red-winged Blackbird fed on the ground under my feeders. She was the first of her species to make an appearance this spring and is right on schedule. This entry was posted in Birding, Birds and tagged Birding, Ducks, Elizabethton Star, Erwin Record, Long-tailed Duck, Northeast Tennessee, Old Squaw, Oldsquaw, Rare birds, Tennessee on March 9, 2014 by Bryan Stevens.